Alice Kalyan and her husband sat in the food court on the fourth floor of their local shopping centre, staring down at shoppers milling around on the floors below. It's a scene repeated across the world, but this shopping centre is in Baghdad's Mansour district. Open a year, it is the city's biggest, but others may soon rival it. The couple live in the Baghdad suburb of Khadra, an area with a heavy military presence, and it is hard for them to get to places like this. "It's our first visit," Alice, 56, explained. "We stayed here throughout the war, though we lived in the UAE for 10 years until 1999. Mostly I don't get out. I mean, we can go shopping in our neighbourhood but there's nowhere like this." The Maximall is popular with younger middle class Iraqi women who can be found on the floors below. It's the template for a new standard for Iraqi shoppers. 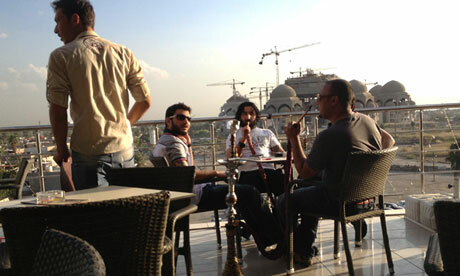 On the outdoor balcony overlooking the domes of Saddam Hussein's vast unfinished mosque – planned to be the biggest in the world – a group of young tattoo artists enjoy a shisha. The city is still on edge, and bombings and killings remain common, so Baghdad's social life is conducted in safe places – in people's homes and neighbourhoods where they are known – or in public spaces where they feel comfortable. The little disco boat that coasts on the Tigris at weekends is largely for groups of young men. But since the end of the sectarian war in 2008, Baghdad has crept towards a cautious normality, albeit under a very heavy security presence at almost every junction. Although there are no bars, alcohol is tolerated in central neighbourhoods of the capital with Christian populations. At the height of the city's sectarian tensions it was available in only the most secretive of backdoor transactions. In hardline neighbourhoods such as Sadr City, selling it will still get you killed. New private parks have sprung up in the city's green spaces to rival the long-established Zawara amusement park, with its rides and gardens, popular with both families and groups of young men and women. One of the recent additions is the Olive Leaves near Jadriya, several restaurants and a playground set among palm trees beside the river. Like the Maximall it is under a year old. Adel al-Omran, the manager, said: "It used to be my grandfather's farm, but it wasn't that financially viable being in the middle of the city so I had the idea of opening this. "Baghdadis have a thing for places like this where you can sit outside and it's safe for the children to play. It's nice here with the breeze from the river, especially in summer." The considerations Baghdadis make over how and where to pursue their entertainment is explained by Mustafa al-Obeidi, 28 and his fiancee, Ala Rubaie, 30, at the al-Faqma ice-cream parlour in Karrada. Both engineering graduates, and unable to get salaried positions, they work as daily contractors for government ministries. "We get out about once or twice a month. We live on opposite sides of the city," explained Mustafa. The ice cream costs $2 – a treat, he admits, when his salary is only $350 (£235) a month. "We come to places like this or go out in Mansour. I started going out again in 2009 [a year after the end of the sectarian war]." Displaced from his home district, he only finally returned three weeks ago. "There are neighbourhoods you avoid and places you feel more comfortable going than others," he adds. "Here it is nice and its secure." Underlining the recent rising tension in Baghdad, Mustafa admits he no longer stays out as late as he did even three months ago, before protests in Anbar and other western provinces with large minority Sunni populations triggered new fears for the country's direction. "I used to stay out until midnight," he says, "but now I try to get home by 9 or 10 o'clock." Adel Abbas is the proprietor of the Top Coast coffee shop and restaurant in the Karrada district. "I started with nothing. I sold the Americans a generator then opened a little shop on one of the bases that became a supermarket. "I got out of that when there were six shops on the base. My business had grown too big for that by then. I bought an old house here and turned it into a restaurant with this coffee shop next door." He fetched some photographs showing the windows of his restaurant blown out after a bomb attack on a nearby police post. "Things started picking up when people started going out again after 2008 but to tell the truth since the Americans left business has only been average. "They were pumping billions into the economy and that was trickling down. Now people have less money to spend. To tell the truth it's getting a little worse each month."